​Inspired by the quote: "Every man is born as many men and dies as a single one." - Martin Heidegger - the artists have been challenging themselves by taking the anonymous adventure of 14 months to self-discussing, self-questioning and working. The aim is to leave their own identities and personalities in order to be able to reach the core of creation. If you are interested in these anonymous artists, who are they, what reason do they choose to appear like that, and what do they feel in this non-identity adventure, come and discuss with them. ​From February 23rd to April 23rd 2019 MoT+++ will host a sound installation from the artist Phùng Tiến Sơn featuring his artwork Soundtracks. the work builds on the artist’s history as a musical composer, as well as his interest in technology thanks to its use of commonly found and customised software. through the digital manipulation of sound, the artist forms a space for quiet reflection from his audience, leaving them to contemplate, among other things, the overarching sense of futility with which the work engages. ​Four acclaimed video artists, Tuan Mami, UuDam Tran Nguyen, Tuan Andrew and Khvay Samnang are traveling to the University of Colorado Boulder to take part in an immersive art program—in the hopes of taking a cross-disciplinary look at environmental issues. Tuan Mami's 30 minutes video work 'In One's Breath - Nothing Stands Still' in "Documenting Change: Our Climate" looks at how artists represent data and visual evidence associated with climate change. March 21, Artist Tuan Mami will screen his film at 6:30 p.m. in VAC 1B20 CU Art Museum, to be followed by a conversation with Cohen and the public. 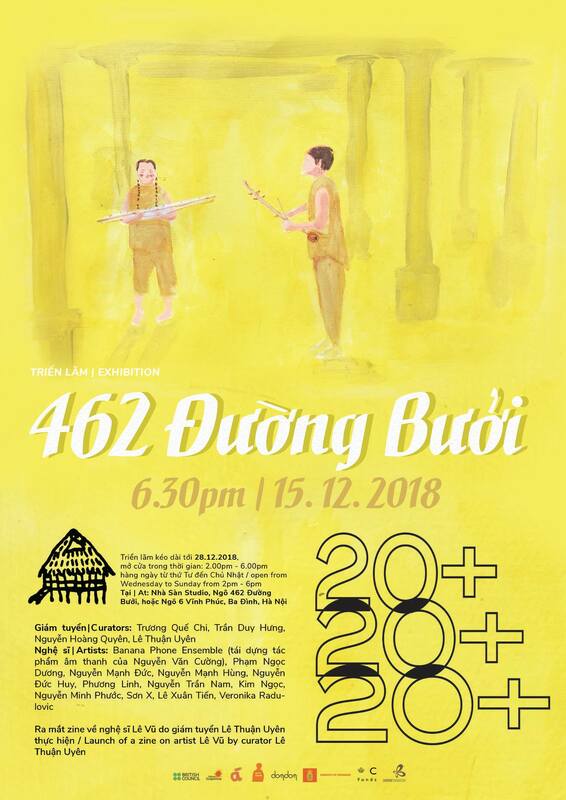 462 Đường Bưởi. Ngõ 6 Vĩnh Phúc. 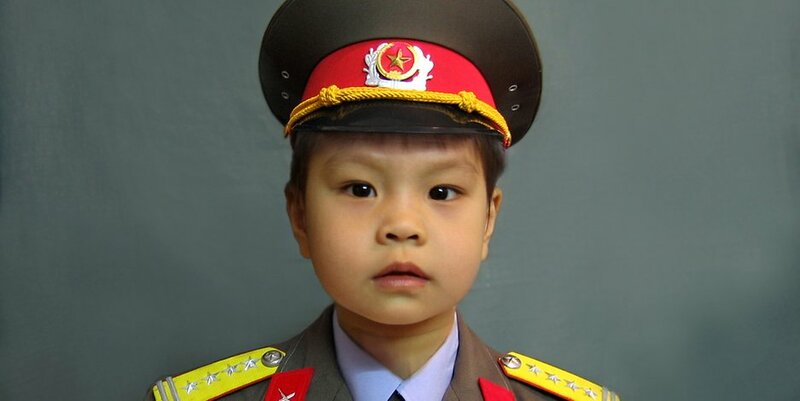 657 Hoàng Hoa Thám. These are addresses—‘address,’ by definition, meaning a collection of descriptive information that locates a house, a structure or an expanse of land. Information that identifies. Might this identified position be scattered across multiple addresses or might it be an incompleteness to somehow be precisely pinpointed? Like Nhà Sàn, for instance? 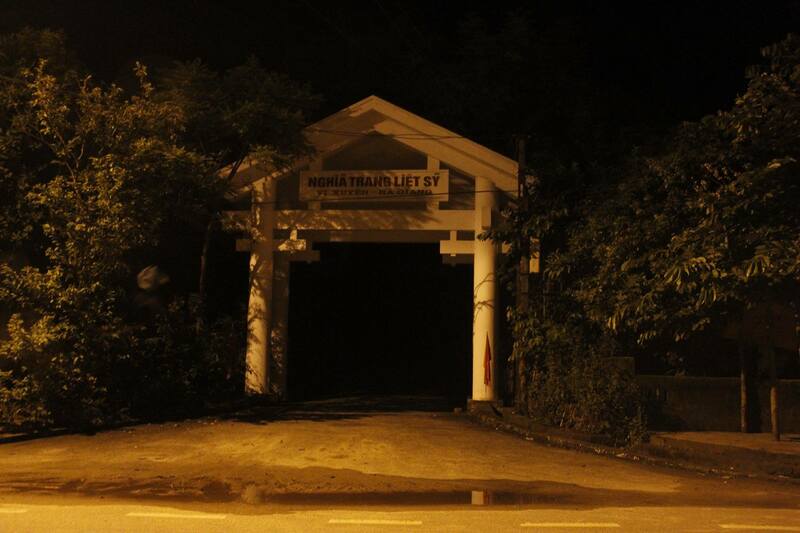 Could it be a schizophrenic place, viewed from within and outside? Could it be a generous place that accepts multiple namings, seemingly incomplete when judged by certain standards or expectations? Or could it simply be a place that has lived long enough? These different addresses, serving as a collection of clues, along with the searches and approaches they contain are deeply contingent on negotiations between various positions—positions occupied by art practitioners such as artists and curators, as well as positions of the artworks themselves, viewed spatially and temporally from plural vantage points. 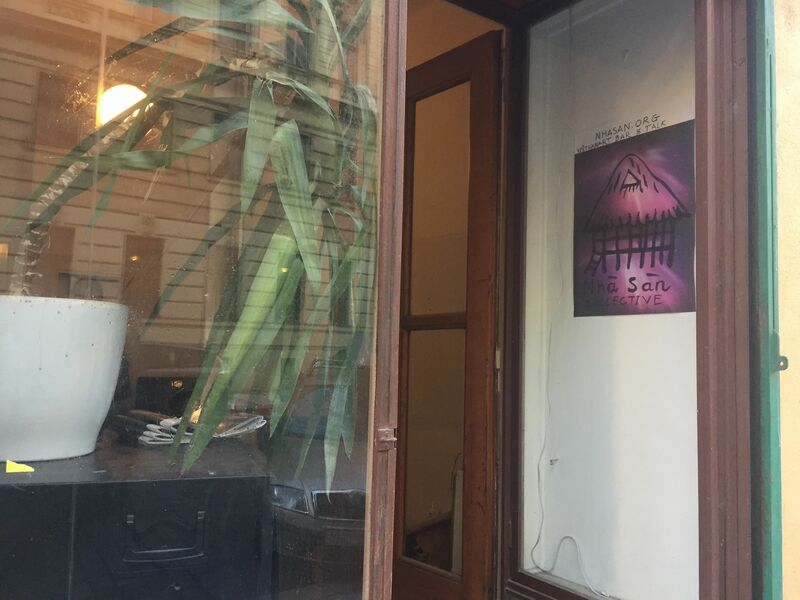 Á Space, Đom Đóm, Hanoi Grapevine, Queer Forever! If one or more significant practices exist among generations of Nha San artists, performance art has always had its place. If we are to imagine this practice of performance art as something tangible then that gives the impression of something passed down through generations, in their own distinctive communication signals. Nguyen Huu Hai Duy was born in Hanoi. He started his experiences with artistic practices initially through observation. 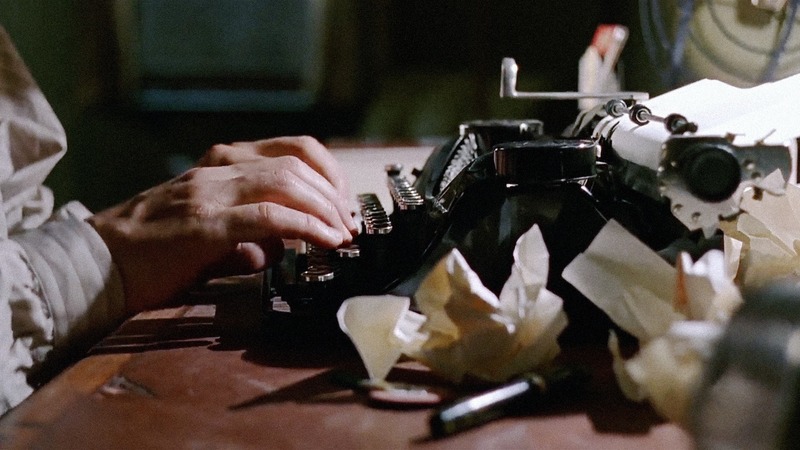 Aside from that, he spends most of his time wondering around, taking note, and archiving into his mind the frivolous and incomprehensible phenomenon. Born 1982, lives and works in Hanoi, and Hoà Bình. He graduated from the Vietnam University of Fine Arts and started to exhibit his works shortly afterwards. He works across multiple disciplines to call attention to the deficiencies in human behaviour. Vu Hong Ninh participated in the 4th Singapore Biennale 2013; Lim Dim, Stenersenmuseet, Oslo, Norway (2009); and continues to exhibit his work throughout Vietnam, Japan, and Europe. Founded in 2010 by six artists, the Hanoi-based performance art group The Appendix (Nhóm Phụ Lục) is currently made up of four members: Nguyễn Huy An, Vũ Đức Toàn, Nguyễn Song, and Ngô Thành Bắc. Using allegorical everyday objects as props, the group performs in a durational, repetitive and at times nonsensical manner in abstractly staged settings, in order to address social issues, or each member’s personal concerns. 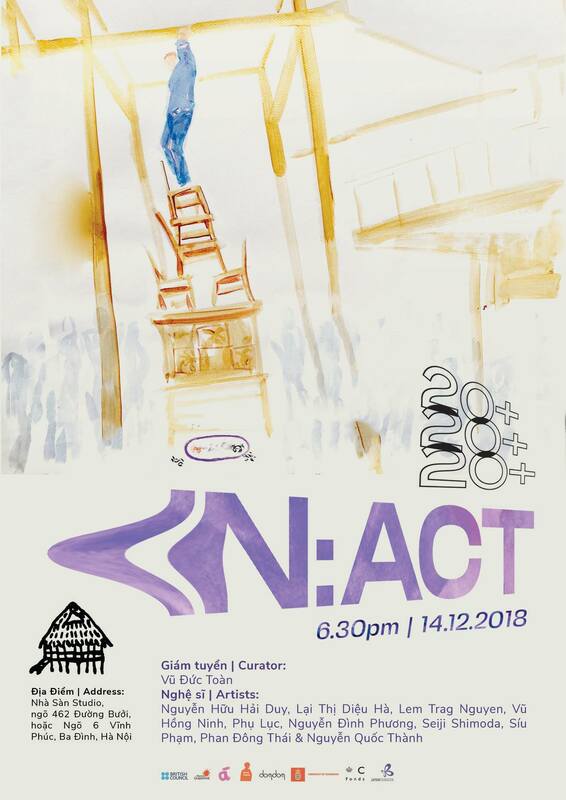 The Appendix Group has participated in various local and international performance art events such as Skylines with Flying People 2 in Hà Nội, as well as performance art festivals in Vietnam, South Korea, and Singapore. Nguyen Dinh Phuong (1989. Born in Moc Chau) graduated from Vietnam University of Fine arts in 2016. Phuong is known for his long and consistent durational performance works. In 2012 - 2013 he stayed in a tent and continued to move to different locations inside the city and the countryside, and to remote, mountainous areas. During this experiment, he encountered countryside people, as well as other homeless people, vendors, police, and had interesting stories with them. After studies, he moved to his hometown which is in a the mountainous area of Northeast Vietnam and continued to experiment with different spaces and his body. In 2017 he did a series of performance in rural areas, which questioned his body movement in relation to the change of spatial perception and understanding, and making of the world. Born in Nagano, Japan in 1953, Seiji Shimoda is a poet and artist, as well as executive director of NIPAF (Nippon International Performance Art Festival) which he founded in 1993. NIPAF has since contributed greatly to the development of performance art and to the formation of a network of performance artists in Asia. Seiji Shimoda has also been working as a part-time lecturer at Musashino Art University (Tokyo, since 2000) and Keio University (Tokyo, since 2015). Since 2004 he has been a permanent final jury member of Chinese Performance Art Document at Macau Museum of Art. studied Philosophy at Saigon, History of Art and Drama Conservatory at Geneva. Busan International Film Festival 2011, Osaka Asian FF, CPH Pix Copenhagen, Hanoi IFF.
. Nominated Best Film, Best Director, Best Editing: AIFFA 2015, etc. - “On the Endless Road”, August 2016, CPH Pix Copenhagen 2016, World FF in Montreal, Poetic Cinema Award at Queens World FF, New York. Etc. Born in 1982. Lives and works Ha Noi, Vietnam. Vu Duc Toan graduated from Vietnam Fine Art University in 2007. 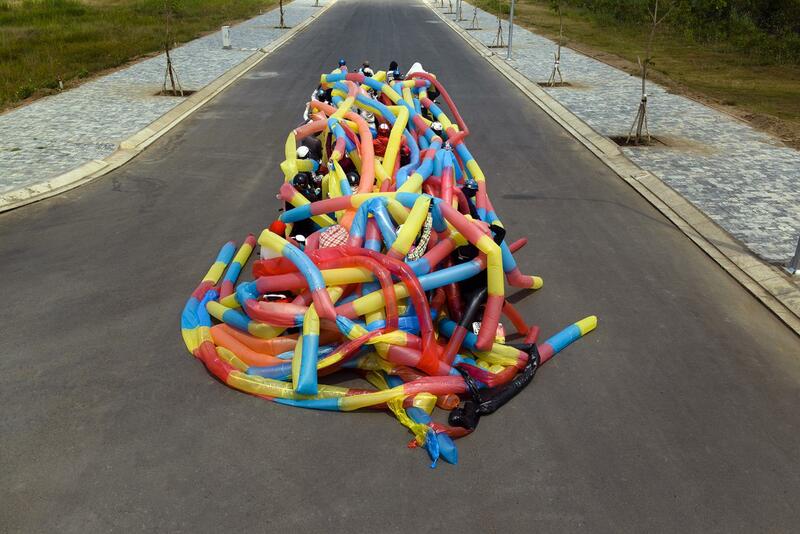 In 2010 Toan co-founded Appendix, a performance collective with 5 other artist friends. He participated in various exhibitions, performance art festival in Vietnam and countries in Asia, such as Japan, Korea, China, Taiwan, Cambodia, and Singapore. Lem TragNguyen is a visual artist, born in Germany and grown up with the intertwined state of the eastern - western spectacle cultures. Lem does not limit herself to any particular form of art, for her making art is the space in which she makes her own discoveries in the course of the creative process, which is characterized simultaneously by action and experimentation; creates essential means to materialize ideas; It contains the potential of both absolute reality and of being the simulacrum of one’s imagination. Phan Đông Thái và Nguyễn Quốc Thành lives and works in Hanoi. Thái is an engineer, while Thành is a co-founding member of Nhà Sàn Collective, and founder and director of Queer Forever!. The duo has started to make performance together since 2016, with an intention to explore issues of intimacy and togetherness. We would like to thank the following for their generous support: Andrea Fam, Nguyễn Huy An, Nguyễn Mạnh Đức, Phương Linh, Mẹ Lương, Phan Thảo Nguyên, Nguyễn Phương Thảo. Partners: Á Space, Đom Đóm, Hanoi Grapevine, Queer Forever! 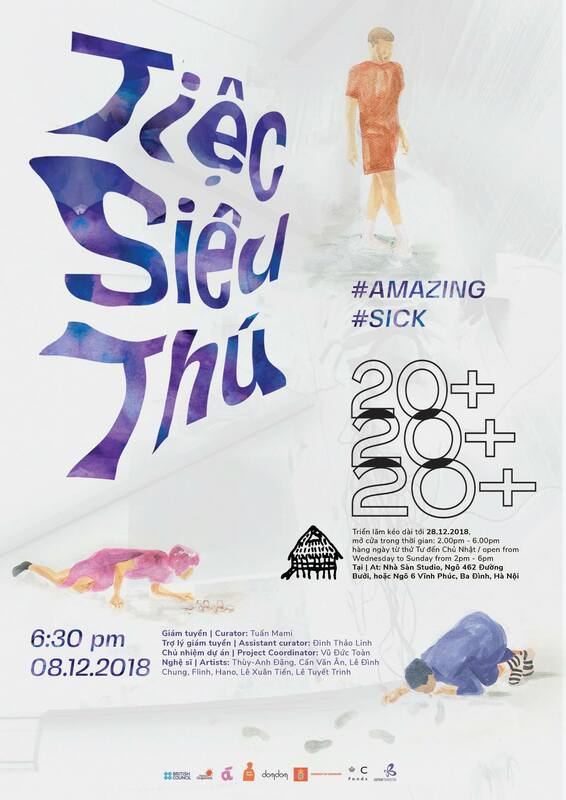 ​Dear friends, we are pleased to invite you to Emerging Artists 6 party #AMAZING #SICK, a part of our 20th anniversary program. #AMAZING #SICK is the artist’s journey of conquering the nothingness - The sensitivity of pure instinctive insight into the chaotic world which is full of irrationality and contradictory. The notion of [conquering / invading] - is probably an inevitable phrase in art or in human movement. With the artist, they are always on the quest for what is ‘going on’, what is ‘undefined’ or ‘unrecognized’, in order to reach the hypothesied world where it can interpret ‘the Reality’ in a more unifying and preciser view. The collation on the vestiges of human beings has made the artist not only aware of his/her distinctive nature but also aware of the origin and process of movement between that micro individual with the macro one. In the #AMAZING #SICK, young artists seem to go into their own 'nihilistic instincts', looking for things that are 'unidentified' or 'unformable' – maybe, to conquer it? to find different interpretations of the meaning of the inseparable relation of Material-Time-Space that humans have been Making up – Using – Invading? Curator Veronika Radulovic, Veronika Witte and Đỗ Tường Linh have organized the Berlin exhibition No War No Vietnam in autumn 2018. The exhibition presented associations between 1960s anti-war documents and artworks and Vietnamese contemporary arts. Through performances, video games or representational works, the Vietnamese artists have created concise war satires or their own satires. No War No Vietnam hoped to direct attentions towards the meanings of the war and Vietnam the country itself in European eyes. ​Artist Nguyen Thuy Tien will appear at the Artist In Residence (AIR) program from Koganecho Bazaar Flying Supermarket 2018. Koganecho Bazaar exhibits works in various genres by 50 artists at locations like Hinode Studio and Kogane Studio under the Railways, and Yokohama Nigiwai-za. Nguyen Thuy Tien was born in Viet Nam and is living in Saigon. She emerged in the Vietnamese art scence a few years ago and has been constantly expanding her practice and experimentation with many medium: Photography, video, text, installation and performance. The program will be from September 21, 2018 to October 28, 2018. 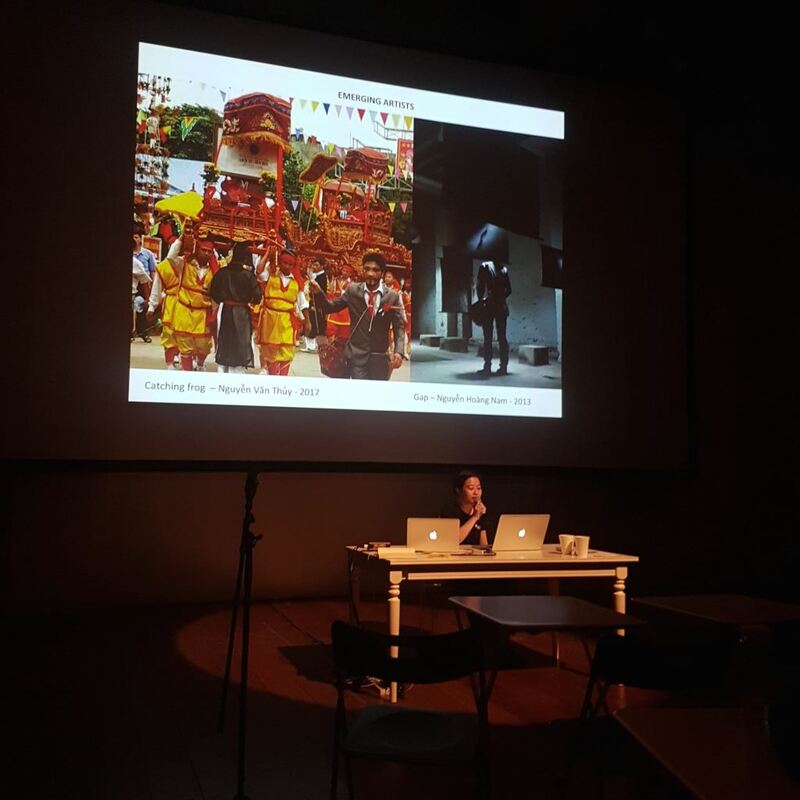 Curator Tuan Mami and Chau Hoang from Nha San Collective participated in the Unlearning Biennale symposium, the first public event of the series of events that would culminate in the first edition of In the Matter of Art - Biennale of Contemporary Art during June 2020, and other artist activities in Europe. ​​Exhibition ‘site / shine / sight’ by artist Truong Que Chi from Nha San Collective opens from 6pm this Friday, September 28 at The Factory Contemporary Arts Centre. The exhibition is a collaboration between visual art and architecture by Truong Que Chi and architectural studio, vn-a. ‘[The exhibition is] an attempt to explore how elements of light can be communicated, perceived, interpreted and even manipulated within the context and conditions of a contemporary art space. 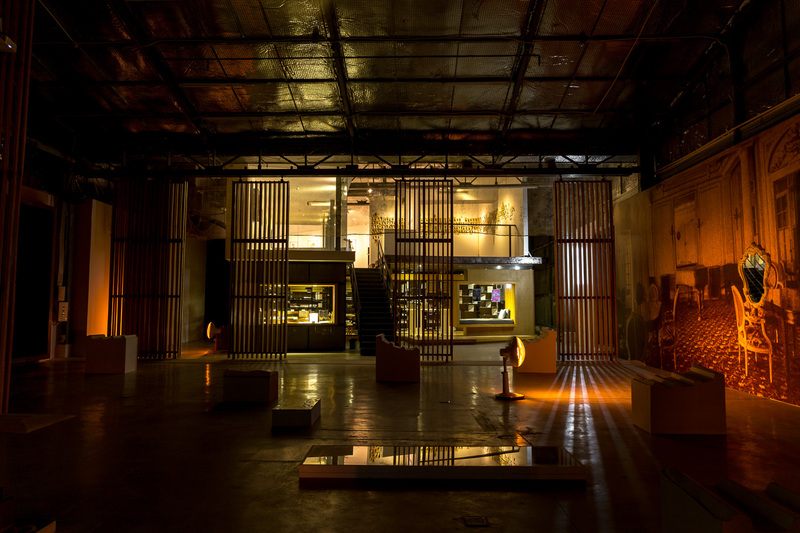 They will transform the space of The Factory Contemporary Arts Centre into a dim maze, where all light emits from the various sculpture, installation and photography within the recesses of particularly placed, structurally specific walls. Such a staged arrangement of objects and architectural elements – the first event of its kind in Vietnam on this scale – seeks to create an atmosphere of a strange faraway place’. 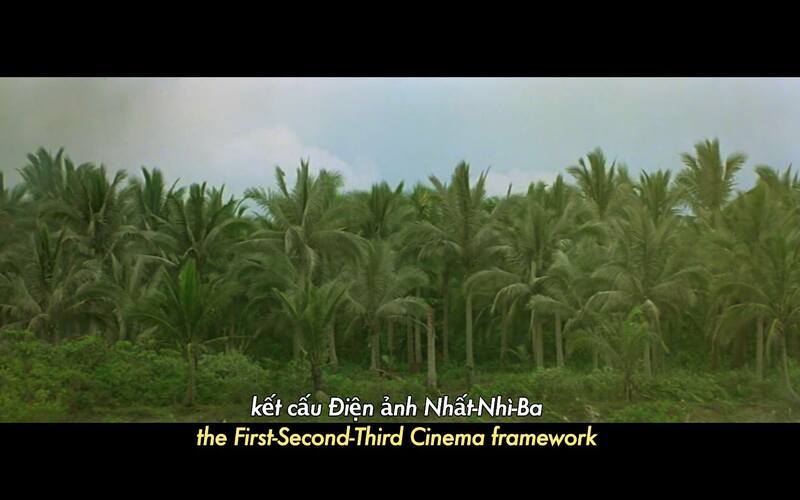 ​Artist Nguyen Trinh Thi from Nha San Collective will premiere her most recent essay film “Fifth Cinema” at the Elevations Laos | Exhibition, "Depths" and museum premiere at Asia Pacific Triennale of Contemporary Art (APT9), Queensland Art Gallery | Gallery of Modern Art (24 NOV 2018 – 28 APR 2019). With text by Maori filmmaker Barry Barclay (“Celebrating the Fourth Cinema, 2003), Nguyen's film is a hybrid moving on multiple cinematic and topical terrains. The film takes viewer through a narrative of colonialism, indigeneity and cinematic limitations in representation. 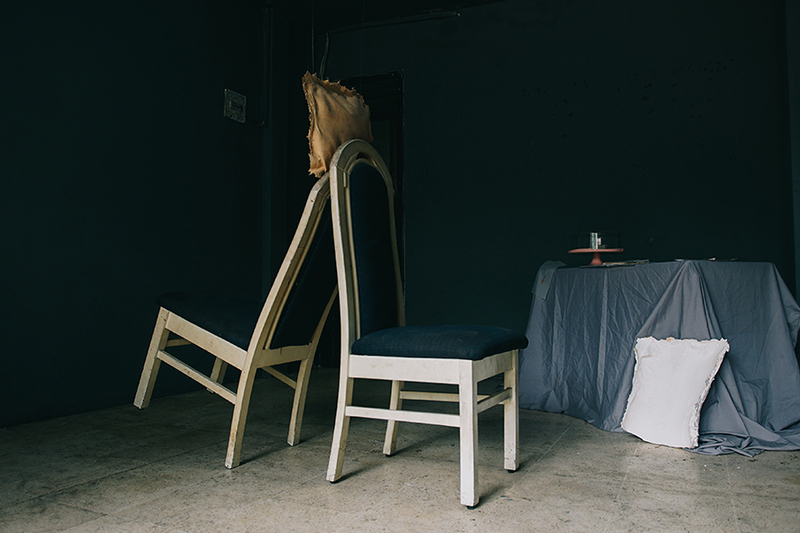 ​Artist Nguyen Quoc Thanh from Nha San Collective joined SIPAF 2018 (Solidarity in Performance Art Festival) in September, 2018. The festival featured Nguyen Quoc Thanh and other international artists. 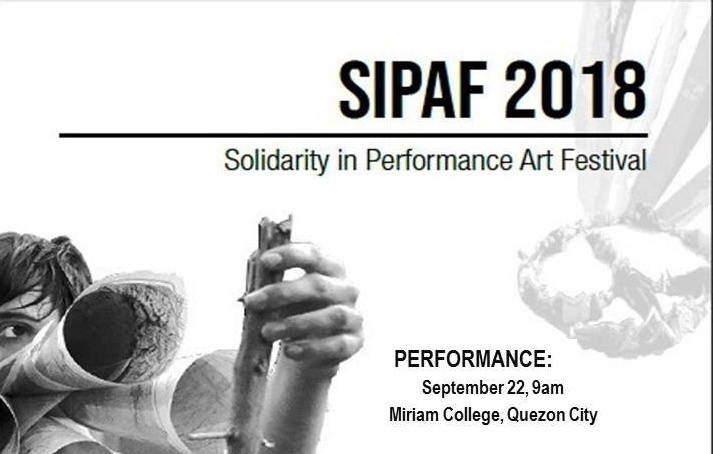 SIPAF is an art festival/ project in the Philippines, promoting cultural exchange, solidarity, and peace. SIPAF will took place on September 12-22, 2018. ‘The Age After Divinity’ was launched on Friday, 6 July 2018 and has been on display till 06 Aug 2018 at Manzi Art Space, 14 Phan Huy Ich, Hanoi. 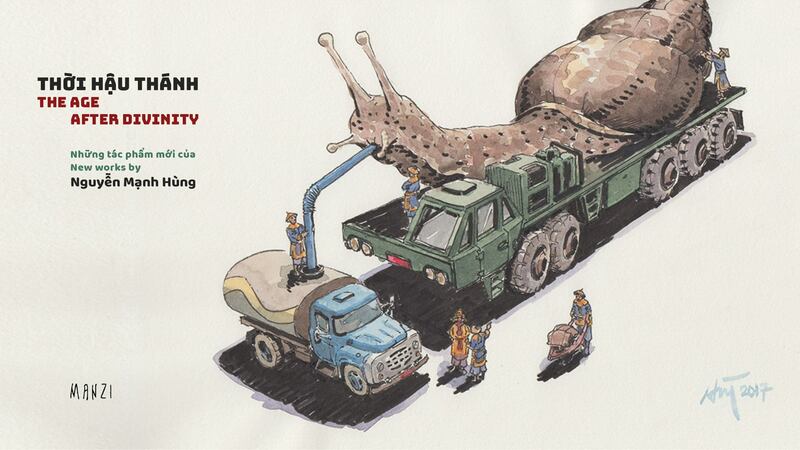 Depicting activities and events of daily life in an absurd world, this series of oil and water colour paintings presents immersive environments with droll juxtapositions that cleverly allude to cultural realities, social conflicts, the complexities of civic development and individual responsibility in Vietnam today. Focusing on the visual relationships of disjointed elements and unusual scales, with 'The Age After Divinity', Hung has conveyed his wry sense of humour and boldly brought audiences to a world in which everything is made bare through his biting irony. ​TheatreWorks Curators Academy is founded by Artistic Director Ong Keng Sen. The Curators Academy, with its first 30 participants from South East Asia, is unique for its international mission to develop curatorial skills in performance as well as interdisciplinary work focused on sustainability, sharing processes, synergy between contexts and curation in Asia. During the Curators Academy, there will also be complete performances presented for both participants and general public. 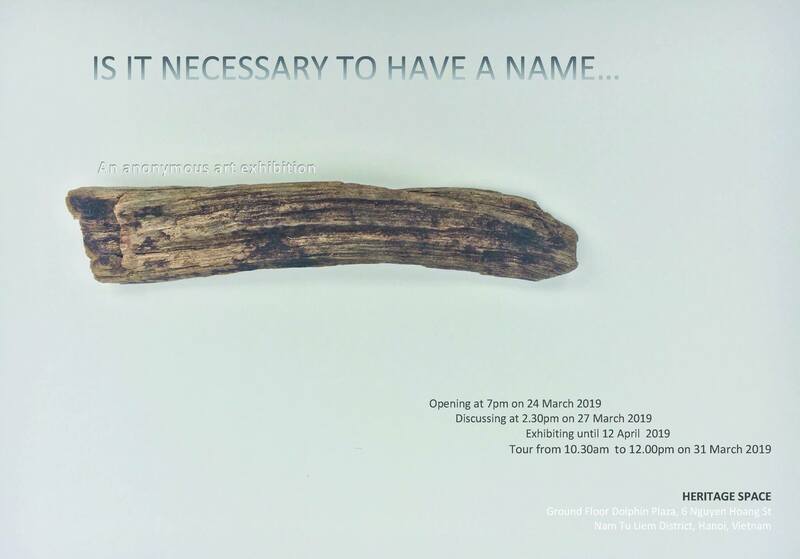 Nguyen Tran Nam having solo exhibition ''Weekend Expansion"
After years of experimenting with different kinds of materials and contemporary presentations; after months of abandoning almost everything; Nam still stays close to his most fundamental action: drawing/writing. Becoming his focus, now, nothing more. Instinctive behavior, unconditional contemplation, thus this diary is the expansion of time, as long as he wants. Nguyen Huy An with solo show "Calculus exercise #6/5"
Future Generation Art Prize is an award for emerging artists launched in 2009 by the Victor Pinchuk Foundation in Kiev, Ukraine. The Future Generation Art Prize is a worldwide contemporary art prize to discover, recognize and give long-term support to a future generation of artists. Artists around the world under the age of 35 may enter the competition through an open call online application available in ten languages, but the application and selection process is also largely driven by collaborative partnerships with contemporary art organizations around the world. Nhà Sàn Collective as one of The Future Generation Art Prize partner platforms would like to help them spread the word about the prize in regional networks and recommend up to ten applicants from our region who will be then promoted to the second round of the selection process. The application will be open for three months online beginning this April 2017. After the application period, the Selection Committee will shortlist twenty artists for an exhibition at the Pinchuk Art Centre in Kiev, which will be judged by an International Jury. The Jury will then award one main prize of $100,000 and one special prize of $20,000. Please visit the website for more information: http://www.futuregenerationartprize.org/. ​​Marking a turning point for contemporary Asia-Pacific artists and curators, the 21st Biennale of Sydney: SUPERPOSITION: Equilibrium & Engagement, is curated by an artistic director of non-Western heritage – Mami Kataoka. 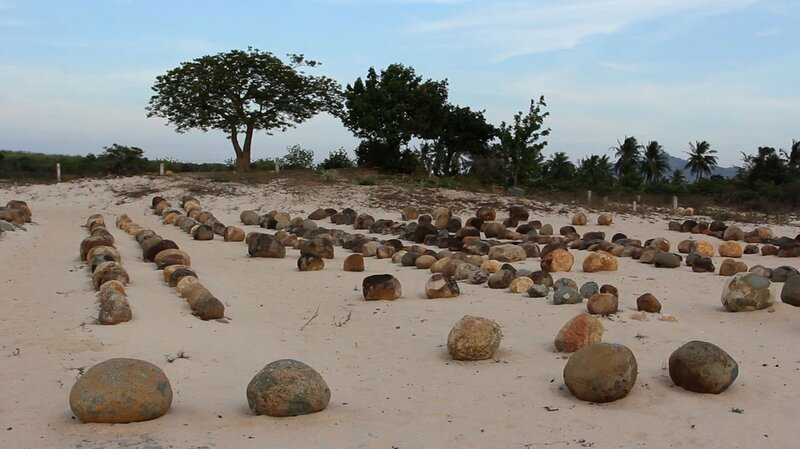 On this Biennale, Nguyen Trinh Thi presents a filmic essay, Letters from Panduranga (2015), in an attempt to shed light on the Vietnamese government's refusal to acknowledge the Cham people, an ethnic minority group descended from the medieval Hindu kingdom of Champa. Presenting glimpses into the daily activities of these people, the film is set against a backdrop of spectacular landscapes in the Ninh Thuan province, whilst also describing the underlying concerns of those inhabiting the land. Phương Linh and The Appendix joining ​"So Far, So Right"
​"So Far, So Right" is a project launched by Taipei Contemporary Art Center and curated by Fang Yen Hsiang. Many artists from different countries (including Việt Nam) are going to participating in this project. Phương Linh and The Appendix ( 2 artists of Nhà Sàn Collective) are joining as well. "Project So Far, So Right is based on the concept of deforming and how it osmoses into the given framework of global governance. The project unfolds from the investigation and delineation of two post-communist narratives as well as their metamorphoses, interweaving relations, and tensions, proposing a possible method to re-entangle their histories and imagined futures, thus launching a new life story." Please check out SFSR 走私計畫 for more information. ​Nguyen Trinh Thi gathered with other Asian artists in Ghosts and Spectres – Shadows of History exhibition, placed in NTU Centre for Contemporary Art Singapore from 1 September to 19 November 2017. “Ghosts and Spectres – Shadows of History” features video installations and films by Apichatpong Weerasethakul (Thailand), Ho Tzu Nyen (Singapore), Nguyen Trinh Thi (Vietnam), and Park Chan-kyong (South Korea). The artists’ research into their own cultural and historical backgrounds gain shape through allegories that re-evaluate the social and political reforms in Post-War and Cold-War Asia. The cinematic works in the exhibition combine fact and fiction. They not only allude to rarely discussed subject-matters but also raise crucial questions about power and authority, construction of narratives, repression of identities, and collective trauma. “Embedded in the vernacular, ghosts, myths, and rituals present systems of knowledge that enable the expression of unknown worlds. “Ghosts and Spectres – Shadows of History” brings to light clouded histories at times not officially recounted but those that remain a lingering presence in collective memories through local mythologies, ghostly figures, and traditions. The works create their own language and systems of reference, reflecting current efforts of exposing written historical accounts and contemporary situations that subvert mainstream narratives”. Please check out https://www.facebook.com/events/155741008336143/?a... for more information.